Daniel needs a hero today, and he’s not alone – so do Nathan, Nora, Sofia, and hundreds more. Every four minutes someone is diagnosed with a devastating blood cancer such as leukemia or lymphoma. But with your help, there can be more than hope – you could be the cure. Bikur Cholim has partnered with Be The Match on an urgent bone marrow drive campaign to sign up as many potential donors as possible aged 18 – 44 to help those depending on a life-saving match. So please be a hero – this could be the most important text of someone’s life. 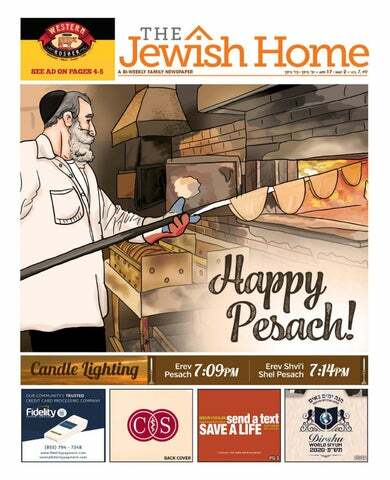 Local Schools Send Pesach Packages to Jews in the Military Yehudis Litvak As the Los Angeles Jewish community prepares for Pesach, local schools and families are reaching out to those Jews who will be spending Pesach away from home, serving the country and ensuring our freedom. In collaboration with Rabbi David Becker, an army chaplain and head of Jewish Friends of American Army, six local organizations collected Pesach supplies and sent packages with everything needed for the seder to Jewish soldiers stationed all over the world. Rabbi Becker explains that his organization’s mission is to provide support for approximately 30,000 Jews currently serving in different branches of the U.S. military. They organize yom tov programs and send shluchim to remote army bases to conduct these programs. Some of these army bases are located in actual war zones, far away from any Jewish community. When a seder or another Jewish event is announced, “Jews come out of the woodwork,” says Rabbi Becker. “They are excited to participate. It brings extremely warm feelings of home. Those Jews become our family and feel a part of family.” Usually, between 15 and 60 Jews attend each seder. At times, sedarim are interrupted by air raid sirens. “You need to stay where you are or run to the bunker,” says Rabbi Becker. He recalls a seder in Bahrain, where an air raid siren sounded, and all the participants had to stay in place until the all clear siren. In his experience as a chaplain, Rabbi Becker saw that Jewish soldiers need the community’s support, both with practical supplies for Jewish life, such as kosher food, and with emotional support in challenging circumstances. Director at Maimonides. She says that the students were very excited to participate, with the Student Council championing the cause. At YULA, the high school students themselves took charge of the project. “I feel really privileged to do this with Rabbi Becker,” says Yael Glick, an 11th grader at YULA Girls. She describes the excitement as students offered to run errands to different kosher stores to collect the necessary supplies. “It was a nice bonding experience,” she says. Yael’s grade got together to pack the Pesach kits. It was especially exciting to send these packages to Kuwait, so close to Egypt, where the story of Pesach took place. Yael’s vision is to share the warmth of the Jewish community with all the Jews in the U.S. military. The participating schools hope to continue their partnership with Jewish Friends of the American Army in the future. the plight of these women and children and to support their rescue. It provides a rare chance to meet a special woman live as she tells her life story and answers questions after her talk. “People aren’t aware how many hundreds of girls are drawn into these nightmare scenarios each year,” says Eliav. “Our mission is to show their plight to the world and save as many lives as we can.” Also appearing live will be Sari, known as “the mother of rescued women.” who has helped to rescue over a thousand women and children. Events are open to the public and will begin May 12th at the Nessah Synagogue, Moshe Ganz Hall and Young Sephardic Synagogue. We look forward to seeing you there. ation to the next, I propose that my young son be the one to eat the matzoh.” The rebbe agreed. “This night,” he said, “is all about teaching the future generations about Yetzias Mitzrayim. We will give the child the matzoh.” After they were freed, the widow approached the Bluzhever Rebbe. She needed help. Someone had proposed a shidduch for her, but she had no way to find out about the man. Maybe, she said, the rebbe could help her. “Can you find out who he is? Can you see if he is appropriate for me and if I am appropriate for him?” “What is his name?” asked the rebbe. The woman responded, “Yisroel Spira.” The rebbe said to her, “Yes, I know him well. It is a good idea that you should get to know him.” She returned to the shadchan and gave her approval to set up the match. When the woman showed up at the right address, standing before her was none other than Rav Yisroel Spira, the man she knew as the Bluzhever Rebbe! A short time later, they married, and the little boy who ate matzah in Bergen-Belsen became the rebbe’s son and eventual successor. Which spiritual attributes did the rebbe see in that woman that led him to marry her? When asked, the rebbe answered that in the cauldron of Bergen-Belsen, where the horizon was measured in minutes and the future was a day at a time, a woman who believed in the nitzchiyus of Am Yisroel, that our people is eternal, and who worried for the future generation was someone with whom it was worthy to perpetuate the golden chain. Thankfully, we aren’t tested the way those holy people were that night in Bergen-Belsen. Our matzos come easy. For a few dollars, we can have as many as we want. We can drink wine without fearing a pogrom. We can eat maror and not live it. We don’t have to make awful choices. We can sit as kings and queens at the Seder, surrounded by different generations, concentrating on doing our best to transmit our glorious heritage to the future generations, ensuring that they know the story of Yetzias Mitzrayim and Avodim Hayinu. May we merit much nachas and simcha, cheirus and freedom, kedusha and mitzvos, at the Seder and every day. personal salvations. In Tehillim it writes, “Tov lehodot lahashem…ulehaggid baboker chasdecha, ve’emunatcha baleilot.” Many commentaries explain this phrase to mean that we praise Hashem during good times so that in dark times we maintain faith. On a deeper level, “ve’emunatecha” means belief in you. This is not just referring to our faith in G-d, but rather His faith in us. He believes in our capacity to find the solution amidst the darkness. Hashem has provided the solution, and anticipates our success in utilizing the tools we have on Earth to find it. Sometimes, the problem is baleilot. It is so dark that the solution is happening, yet we can’t see it—even if it is right in front of us. We must remember that Hashem is orchestrating everything, even when it is not visible to us. I had a student who was upset about a guy who ended their relationship. The pang of rejection stung, yet during her time of inner turmoil, unbeknownst to her, Hashem was opening a new door for the man that she is now engaged to. Sometimes the “baleilot” is simply too large or overwhelming to simply say, “Everything is fixable.” When we are in such difficult beleilot, the solution may just be to remember that Hashem is with us in our moment of sorrow. At other dark times, the solution is the growth that occurs within us. We can ask ourselves lemah—what is the reason for this—rather than lamah— why is this happening to me? The solution is about who we become through the process of our pain, rather than the final outcome. Sometimes the “everything is fixable” catchphrase has more to do with reassuring our inner selves than an external situation. Next time you are amidst a test, with a problem permeating your entire being so thoroughly that you see no way out, remember that everything is fixable. Whatever the test may be, gather up and assemble all the information you have in your arsenal. Call upon your courage, the strength in your inner sanctuary, in your soul. Vayakel, open up your personal drawer, and you will discover the key that will unlock the gates of peace of mind and blessing. The solution is in there, we just have to find it. three days—from getting in trouble for rude behavior towards a substitute teacher, to saving the day and subsequently asking for the help she needs—is both inspiring and realistic. If it helps just one reader decide that he, too, needs help—and that asking for assistance is not a weakness but something to be admired—then Klempner has not only written a page-turner, but one that could truly help change people’s lives. 1943 The future of our nation seemed bleak. The great centers of Torah learning were all but destroyed, consumed by the flames of the Holocaust. Torah life in America was weak, with little Shabbos observance and almost no established Torah learning. AND THEN IT ALL CHANGED. With the transplantation of the great Yeshivos from Eastern Europe to America after the war, a new Torah landscape emerged, changing the face of Torah infrastructure forever. Under the leadership of various great Rebbeim, Gedolim and Roshei Yeshivos, Torah in America began to flourish and prosper, becoming the thriving center of Torah we are zoche to be a part of today. 1997 In 1997, Dirshu was founded as another step in the journey to rebuild and restore the world of Torah Jewry to the glory of previous generations. Dirshu’s mission is to increase Yedias HaTorah, Limud Mussar and Limud Halachah, and reignite the spark of Limud HaTorah by instituting worldwide programs that encourage true acquisition of Torah and Halachah. In 2020, at the Dirshu World Siyum, we will celebrate together the culmination of Klal Yisroel’s efforts to reignite worldwide passion and love for Limud HaTorah. ELEVATING THE TORAH LANDSCAPE FOREVER. Join Dirshu in this monumental journey and change the way you learn – forever. olocaust stories, survivors’ journeys, and concentration camp recountings are all different and are all miraculous. In some ways, though, they are familiar. We visualize the tracks as trains take victims into the heart of darkness and as families trudge under the mocking Arbeit Macht Frei placard. We tote up the losses, the stories, the faith, and the despair. Reb Shmuel Chaim Soroka’s journey begins with a well-known story. An Alter Mirrer, his journey begins in Kamenetz, Poland, and continues across Siberia with the Mir Yeshiva to Kobe, Japan, and Shanghai, China – but then it continues. Unlike others trapped in Shanghai for the duration of the war, Reb Shmuel Chaim and two friends received visas to America in November 1941, boarded a boat, and left. Their boat arrived in Manila in the Philippines –the very day the Japanese bombed Pearl Harbor. With the arrival of the Japanese, Manila was no longer under American control, and Reb Shmuel Chaim and his friends were taken by the Japanese as prisoners of war. For the next four years, he was in concentration camp, but not a Nazi one: Japanese concentration camps located in and outside Manila, the capital city of the Philippines. His story, as described in Dr. Mordachai Buchie Soroka’s book, A Mirrer in Manila, is thus wholly different. Dr. Soroka spent years researching and examining his father’s odyssey and documenting it, weaving the story of a young man fleeing for survival against the backdrop of war. The saga took place on the other side of the world – far from Auschwitz and Bergen-Belsen – the other theater of World War II: the Pacific theater. a city now part of Lithuania. Reb Shmuel Chaim cabled his only uncle in the United States, Uncle Max Simchowitz, to send him funds and affidavits toward a visa to America. By 1940, the Lithuanians wanted the refugees out of Vilna, and the Mir Yeshiva moved to Keidan. But within seven months, Lithuania became a republic of the Soviet Union, and the yeshiva students were forced to disperse, in four disparate groups, to small villages in what was once northern Lithuania. The Nazis were advancing on one side, the Communists – who hated religious Jews – were on the other side, and Reb Shmuel Chaim and his fellow yeshiva students were trapped. What were the bochurim’s families to do? They were caught; they had lived through pogroms before, but even if they could leave, what about the elderly? Reb Shmuel Chaim’s family was stuck in Kamenetz, and he worried constantly about them. His mother sent him loving letters, “We were emotional and cried when we received your letter. Don’t worry,” she consoled him, “we have what to eat.” But then it was the final goodbye. The yeshiva was traveling across Poland and into the Soviet Union. Reb Shmuel Chaim met his father at the border. R’ Yosef brought him a coat and food from his mother. His father removed his boots and gave them to his son. Reb Shmuel Chaim gave his wristwatch to his father and begged his father to allow him to take his eight-year-old little sister with him. R’ Yosef refused, wanting to keep his family together. But he gave his son a firm and emotional directive: We don’t know who will live and who will die. Stay with the yeshiva. That was the last they spoke. Recently, a letter written by R’ Yosef to his only son was found. It is perhaps the last extended communication that Reb Shmuel Chaim had with his family. In the letter, R’ Yosef writes: “My dear son. You should know, my beloved son, there is a Divine plan and a reason that the Creator of the World placed you in an environment that will forever bind you with the Holy Torah. Truthfully, it is my only consolation that you follow Hashem’s dictates and He will be pleased with you. This is the main reason why the world was created, to be committed to the Torah forever…. “Do not stray from your Yiddishkeit, not even in the minutest matters. If you have doubts or questions ask your rebbeim and don’t make your own decisions. I’ve given you basic knowledge; build on it. Even though I’ve written this letter quickly, and at night, it contains many thoughts. Keep it with you in yeshiva, read it constantly, and be committed to its content. In this merit Hashem should enable that you merit witnessing the consolation and rebuilding of Yerushalayim.” Reb Shmuel Chaim received two more postcards from his family before all communication ceased. The Nazis had arrived. The Jews were gathered into a ghetto in Kamenetz, and, in 1942, Reb Shmuel Chaim’s parents, R’ Yosef and Minka; his three sisters, Sarah, Esther, and Rivka; their children; R’ Shimshon Zimel; and Reb Shmuel Chaim’s brotherin-law, Rav Velvel Kustin; were shot. According to the Kamenetz Yizkor Book, fewer than ten Kamenetz Jews survived the Holocaust. Reb Shmuel Chaim’s close friends, Iko and Mottel (Mordechai) Rabinowitz, got word as well. Then, on July 1, the Americans blocked all immigration, even for those approved and with visas; the Japanese extended his visa through August, assuming by then he would be able to leave. Reb Shmuel Chaim went to a clinic for vaccinations against cholera, smallpox, typhoid, and dysentery, inoculations that served him well in the coming year…. By late August, though, the Japanese had had enough. Reb Shmuel Chaim left with the rest of the Mirrer Yeshiva to Shanghai. There, the yeshiva found, miraculously, a beautiful little-used shul that became their bais medrash for the years to come. The shul had been built by a Sephardic Jew in 1927 and had the exact number of seats to accommodate the yeshiva. The famous photo of the yeshiva in Shanghai features Reb Shmuel Chaim in the front row near the mashgiach Rav Chaskel Levenstein, zt”l, and the rosh yeshiva, Rav Chaim Shmuelevitz, zt”l. Reb Shmuel Chaim’s stay in Shanghai was short-lived, and by late November 1941, he had procured both a visa and passage to the United States with his uncle’s hishtadlus, via Manila in the Philippines. His friends were happy and amazed; he was looking forward, but knew he would miss his yeshiva terribly. Before leaving, his yeshiva friends signed a postcard of a Shanghai street scene for him. Reb Shmuel Chaim gave his wristwatch to his father and begged his father to allow him to take his eight-year-old little sister with him. “Now I know how the enslaved Jews in Mitzrayim felt when they built Pisom and Ramses.” And he helped rebuild the camp. While at first the Japanese allowed the prisoners to plant vegetables and barter for food with the natives, a new military and particularly cruel commandant put a stop to all of that. The commandant confiscated food the prisoners grew, cut the food supply to 700 calories per day per prisoner, and gave rations deliberately contaminated with pebbles and rat droppings. In September 1944, American forces under General Douglas MacArthur (who had famously declared, “I shall return” when the Americans were ousted from the country) began the liberation of the Philippines from the Japanese. As the American army grew closer to Manila, in early 1945, the Japanese commandant grew crueler and more unreasonable. He appropriated food from the Red Cross, letting the prisoners starve, which led to night blindness, disease, and death. Reb Shmuel Chaim contracted malaria and developed jaundice, dysentery, and beriberi. Precise, Profound A Pleasure to Use. — All newly typeset with stronger binding! Now Available in 2 Convenient Sizes! slaughtered and tortured by Nazi hands. Now free, Reb Shmuel Chaim was able to recover from illness and regain strength, procure a position as a clerk with the American army in the Philippines, and try, once again, to come to the United States. His efforts were again frustrating. At one point, he boarded a boat to the United States with hundreds of other rescued prisoners and was removed from the ship because his visa had “expired.” Never mind that it had expired because he had been taken as a prisoner of war. No amount of logic or discussion could convince the officials otherwise. Reb Shmuel Chaim and his uncle eventually persevered, and, in February 1946, long after his yeshiva friends in Shanghai had arrived in the United States, Reb Shmuel Chaim touched ground in America. Reb Shmuel Chaim Soroka’s full story is recounted in A Mirrer in Manila by Mordachai Buchie Soroka, published by Feldheim in 2018. Discover the bestselling Haggadah of 2019 Vibrant, sophisticated art that brings the epic exodus story to life! Includes modern English translation, transliteration and the full Hebrew Haggadah text. rah, his friends, and his family. As my grandmother often reminds us, Zaidy did not leave us with great wealth or great titles. But he left us with a shem tov. That is our legacy, and that is his story. Tehi zichro baruch. and interpreting your words (see previous articles on Alexa and Shabbos at TribeTechReview.com). For the Amazon Alexa device itself that plugs into a wall socket, I previously recommended you use a smart plug and turn the device off completely for Shabbos. However, thermostats are low-voltage and hardwired so turning the power off is not an option. Like all other Alexa devices, there is a physical/manual way to mute the microphone but no way to automatically or programmatically (using a HUB or IFTTT) turn off the microphone. While you can manually turn this off for Shabbos and then back on later, this is far from ideal. Additionally, when you mute the microphone, the Ecobeee4 has a sizeable “Light Bar” that turns on and glows bright red until Alexa is re-enabled. This is a harsh visual that can be quite irritating in any room, but especially in a bedroom. Unless the Alexa feature is critical, I recommend you try another model. This is only the beginning of the Shabbos issues, as you will shortly see. The Ecobee3 is identical to the Ecobee4 in features but without having Alexa built in. Both contain Occupancy and Motion/Proximity sensors that can be an issue on Shabbos. The Ecobee3-Lite has a Motion/Proximity sensor but does not come with an Occupancy sensor unless you add one. The differences between Occupancy and Motion/Proximity sensors are subtle. Motion/Proximity is a simple sensor that detects clear motion such as walking in front of or passing by the thermostat. The Occupancy sensor is more sophisticated and uses PIR (Passive Infrared) that is heat-sensing. Occupancy detectors aim to differentiate between if you are home and sleeping vs. away and on vacation. They are like night-vision goggles which use the heat emitted from our bodies to detect human presence. The Ecobee Occupancy sensors even attempt to differentiate between you and your dog. Both sensor types would have identical issues on Shabbos that would require them to be turned off, though the Occupancy sensor may be less obvious to the uninformed. To discuss the potential tech work arounds and arrive at a Shabbos rating for all three versions of the Ecobee thermostats will require a dedicated article, so please stay tuned for Part II in our next column. Shabbat Shalom! Last week, Sudan’s leader, Omar alBashir, was toppled by the army after 30 years in power. A military council has promised elections to the people in two years’ time. Over the weekend, protesters took to the streets to demand a full dismantling of the “deep state” culture left behind by Bashir. They want a civilian administration to take over the country, and they chanted “Freedom” and “Revolution” during the sit-in. Bashir has been indicted on charges of war crimes and crimes against humanity in Darfur by the International Criminal Court. He denies any wrongdoing. The military council, attempting to assuage protesters, has announced a raft of decisions, including new heads of the army and the police; a new head of the powerful National Intelligence and Security Service (NISS); committees to fight corruption and to investigate the former ruling party; the lifting of all media restrictions and censorship; and the release of police and security officers detained for supporting protesters. Coup leader Defense Minister Awad Ibn Auf had announced that the military would oversee a two-year transitional period followed by elections. When demonstrators – who had been protesting since December over the high cost of living – weren’t appeased, Ibn Auf resigned the next day, just a day after taking the position, and went into retirement. Lt. Gen. Abdel Fattah Abdelrahman Burhan was then named as head of the transitional military council, and became Sudan’s third leader in as many days. pressured countries all over the world to crack down on the organization’s activities. Hamas’ use of ostensible charitable organizations to raise money can be seen in the Dusseldorf-based Ansaar International that was raided this past week. Founded in 2012, it calls itself an aid organization carrying out projects “for the good of Allah.” According the organization, it provides vital health services in Gaza, including clean water and sanitation, orphanages and education to the needy. Yet German police say that the funds raised by the group were instead going to train armed fighters to attack Israel. Assange Arrested Wikileaks founder Julian Assange was arrested outside the Ecuadorean Embassy in London on Thursday and will likely be extradited to the United States to face federal conspiracy charges for leaking sensitive government documents. Assange was found guilty for failing to surrender to the court back in 2012. District Judge Michael Snow called Assange’s behavior “the behavior of a narcissist who cannot get beyond his own selfish interest.” Assange faces 12 months in prison and will be sentenced shortly. The UK is currently weighing a request by the U.S. to extradite Assange. The United States alleges that Assange conspired with former U.S. intelligence analyst Chelsea Manning in 2010 to download and release classified databases. Moreno told the Guardian that Assange overstayed his welcome at the Ecuadorian Embassy in London when he used it as a “center for spying.” “Any attempt to destabilize is a reprehensible act for Ecuador because we are a sovereign nation and respectful of the politics of each country,” he said in his first English-language interview since Assange’s arrest last week. “We cannot allow our house, the house that opened its doors, to become a center for spying.” He added: “This activity violates asylum conditions. Our decision is not arbitrary but is based on international law.” Moreno added, “He was a guest who was offered a dignified treatment, but he did not have the basic principle of reciprocity for the country that knew how to welcome him or the willingness to accept protocols [from] the country that welcomed him,” he added. “The withdrawal of his asylum occurred in strict adherence to international law. It is a sovereign decision. We do not make decisions based on external pressures from any country.” Ecuador has claimed that Assange mistreated embassy staff, put excrement on walls, left soiled laundry in the bathroom, and improperly looked after his cat, among other things. Jennifer Robinson, who is representing Assange, says that Ecuador has been spreading falsehoods about her client. KOSHER LUXURY IN ST. MORITZ Experience the spectacular mountain setting combined with strictly kosher gourmet dining, exceptional five-star service and countless activities for the entire family in the breathtaking surroundings of the Swiss Alps. Book your stay from 30 June to 1 September 2019 now and benefit from our early booker rate. +41 81 838 3067 info.stmoritz@kempinski.com www.StarGuest.com/stmoritz Glatt Kosher leMehadrin under the supervision of Rabbi B.Z. Rabinowitz Of Biala, Chief Rabbi of Lugano..
Candida auris can cause different types of infections, including bloodstream infection, wound infection, and ear infection. The fungus has also been detected in respiratory and urine samples, but the CDC says it’s unclear if it causes lung or bladder infections. aforementioned elections. But May’s failure to get any deal approved by Parliament has the UK no closer to a deal that would enable it to leave the EU without suffering from dire economic consequences. Speaking to the House of Commons on Thursday, May said she “profoundly” regretted that she was unable to get any deal approved. “The whole country is intensely frustrated that this process of leaving the European Union has not been completed,” she said. Aye, aye. military exercises with Seoul in order to enable negotiations with North Korea to move forward, the U.S. military still conducts smaller maneuvers with their South Korean counterparts. U.N. envoy Ghassan Salame reported that a school was bombed in the town of Ain Zara, around nine miles southeast of Tripoli, without saying who was responsible. Both sides have carried out airstrikes in the town. The U.N. health agency reported on Sunday that more than 120 people have been killed since a Libyan military commander launched an assault on the capital city earlier this month. On April 5, Field Marshal Khalifa Hifter of the Libyan National Army launched a surprise offensive against Tripoli. In addition to the more than 120 people who have been reported dead by the World Health Organization, more than 560 have been wounded. It has not been reported whether the injured and dead were fighters or civilians. Furthermore, over 13,500 people have been displaced, and according to the U.N. Office for the Coordination of Humanitarian Affairs, “significant numbers of civilians” are stuck in areas where fighting has escalated. Honoring Our Traditions As a member of the Orthodox community, I am pleased to have joined the Mount Sinai family as an Advance Planning Representative. After years of chaos following the 2011 overthrow of longtime dictator Moammar Gadhafi, Hifter had vowed to unify the country. He has led previous campaigns against Islamic militants and other rivals in eastern Libya and has received support from the United Arab Emirates, Egypt, Russia and France. Hifter met with Egyptian President Abdel-Fattah el-Sisi in Cairo on Sunday, though the president would not provide further details. ISIS Leader Confirmed Dead Philippine officials confirmed on Sunday that “Abu Dar,” the last surviving leader of the ISIS-affiliated Maute Group, had been killed along with three other insurgents in a military clash last month. His death follows a month’s long military operation in the region. Security forces believe Abu Dar had led Dawla Islamiya, an alliance of pro-ISIS fighters in southern Philippines that includes foreigners. “For now his group is leaderless,” said Defense Secretary Delfin Lorenzana. “We are monitoring who will replace Dar.” Abu Dar, whose real name was Benito Marohombsar, was killed in March following clashes in the town of Tuburan, near Marawi. However, doubts concerning his identity led to the use of DNA testing. The results have shown that Abu Dar was the person who was killed in the battle. The ISIS leader had been involved in planning the 2017 siege of Marawi, a fivemonth battle which effectively flattened the city. He fled to the mountains following the siege but continued recruiting and training fighters from afar. “[This is a] significant accomplishment of the government and the people of Lanao del Sur who worked together to rid their beloved province of terrorists,” said Major-General Roberto Ancan, commander of the army’s 1st Infantry Division. over illness. Today, over 1,100 researchers at Cedars-Sinai work tirelessly on new cures, while our dedicated doctors, nurses and staff members provide healing The statue of Moses located on Cedars-Sinai’s main campus. triumphed over slavery thousands of years ago, our work will not cease until we have made disease part of history as well. Cedars-Sinai would like to wish you a happy, healthy Passover.